In late 2009, a collaboration between In T'Hutch Ltd., and the Rochester Institute of Technology (RIT) resulted in a prototype configuration of the Voglesong Coloref, which provided a CRM for scanning spectrophotometers, such as the ISIS Eye-One from X-Rite! With the suggestion made by RIT to configure the CRM for scanner measurement, the versatility of the Voglesong Coloref shines! Here is one tool that can be used to verify the performance of all of the spectrophotometers within a company, which offers the color characteristics, precision, durability of ceramic tiles! 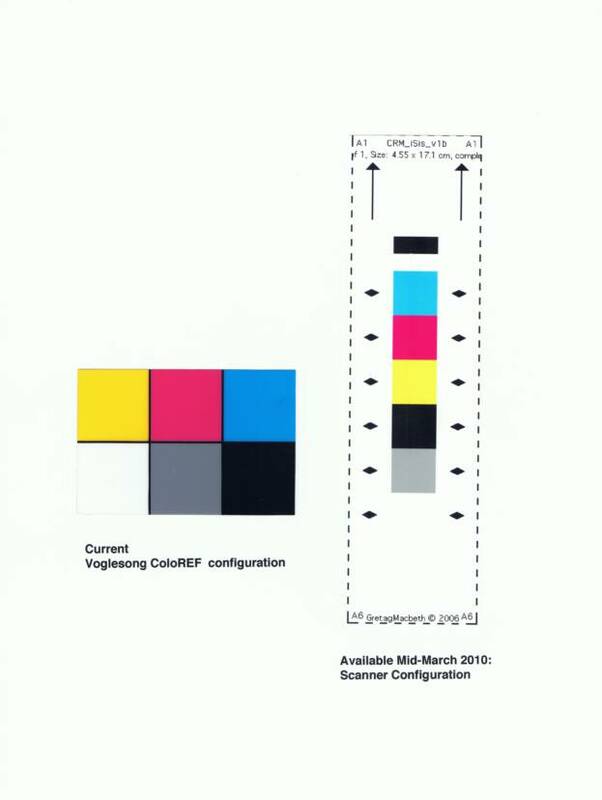 The current versions of the Voglesong Coloref contain CMYK, with cyan magenta yellow, black, white, and 50% gray patches. It is a business-card -size CRM, with data offered as full spectral values, CIE L*a*b*c*h*, and Status T and E densities. The new configuration, a result of the RIT Collaboration, is flexible, 6 patch card, configured to be read by ISIS Eye-One Scanning Spectrophotometer, as well as strip readers, and can also be read by hand-held or fixed spectrophotometers. Voglesong Coloref as configured to be read by scanning spectrophotometers, such as ISIS Eye-One, by X-Rite.